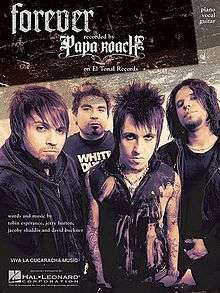 "Forever" is the second single from Californian rock band Papa Roach's fifth album, The Paramour Sessions, and ninth released single in total. "Forever" peaked at #2 on the Modern Rock Tracks (for nine weeks) and #2 on the Mainstream Rock Chart (for six weeks). There was a contest on YouTube in which fans created their own videos for the song, with the official video, directed by Meiert Avis, shot on May 23, 2007 in the Los Angeles area. On June 15, 2007 the video made its official debut on AOL.